But WHAT FUN it was, making my very first Shabby, Raggy, Soft and Snugly Rag Quilt, from a mix of (Organic Cotton Sateen and Quilting Weight Cotton) fabrics featuring designs from my "Shabby Rose" Collection. From Fabric to Quilt Above. "Easiest Quilt Ever! The Rag Quilt Tutorial"
Beautiful fabrics and a beautiful finished labour of love! It looks so good! Love the combos of your beautiful designs you've used. Really sweet quilt! It looks fabulous - definitely worth the mess! WOW Kris, your rag quilt looks fantastic!! :-) Aren't they so much fun (and messy) to create? Even with all the mess they make they are so addictive. Thank you so much for including my blog in your post! I am completely flattered and blushing with excitement just seeing my blogs name up there! You've made my week! 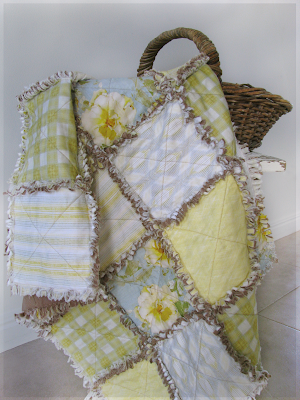 So thrilled that my rag quilts have inspired you!! Thanks for the shout out! 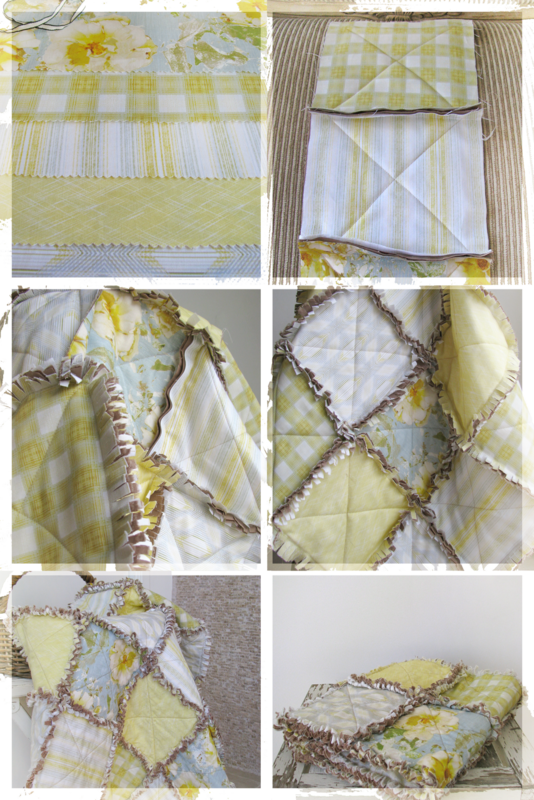 I absolutely LOVE the fabrics you used for the rag quilt! I am going to have to get me some of that line. It's beautiful ~ love it! Your designs are perfect. Looks fabulous! You are so talented. Thanks for finding me too. I love it! It looks wonderful and comfy cozy! Now for a cool day and a cup of coffee ~ just don't spill it on your masterpiece! I love it! I have always thought it would be cool to make my own quilt but i just don't think i'm very talented that way. I'm usually just winging it and have done mostly curtains and those are easy... quilts ... don't look so easy to me lol. Gorgeous quilt. I think there is at least a piece of thread in every room of my house...it follows me!!! Going to checkout the quilt tutorial now. Kris,I love the combination of your beautiful designed fabrics. It is such a refeshing piece and again would be a stunning throw on the big wrap around porch with the wicker swing....or anywhere for that matter...super! Love love love this! I have always wanted to make one of these beauties! Making one of these is what I have choosen as my first quilting project. I love the way they look and it just looks comfy and cozy. Wish me luck..I am new to sewing! Love your fabrics and colors...it's beautiful! Will b wanting to have a go at one or two myself now!lol! Love your blog and inspiration! Is it really the weekend ... ? First Square ... sneak peek!